We all know the scene: a few carefully sung words by Mary Poppins, and the Banks’ children’s dolls and clothes march into the toy chest and fold themselves neatly into the closet. Parents and kids alike wish it were real. But no amount of singing or snapping is going to make that nightmare of a bedroom clean itself. And despite your best efforts, nagging isn’t working either. While you might not have Mary Poppins’ super powers, you can employ strategies that will help your kids clear their clutter and rediscover that they do have a floor under that mess. 1. Give the mess a rest. What’s the worst that would happen if your kids never cleaned their rooms? Toys would get lost or broken, clothes would stay stained—and that’s no fun. To let these natural consequences do the dirty work for you, first warn your kids about the pitfalls of a messy room and assure them you have complete confidence in their ability to keep things tidy on their own. Then, say nothing when nature runs its course. Refuse to rescue your kids by replacing a missing toy or running an emergency load of laundry, and soon enough, the rooms will get straightened and a lesson will be learned. 2. Wake your kids’ inner room-cleaner with an alarm they’ll notice. The next time dirty socks and building blocks start intermixing, resist the need to nag. Instead, do a little planning so you can phrase it this way: “When your room is clean, then you may go play with your friends.” The “sugar” in your sentence can be any regularly occurring privilege, from enjoying TV time to eating dinner—but avoid offering rewards or bribes, as you’ll continually have to up the ante. Also, allow plenty of time for a thorough cleaning to take place—depending on the size of the mess, that’s probably at least 20 minutes before a favorite show or dinnertime. 3. Swallow your need to control. Nothing short of magic can control another person—but you can control your own reaction. Keep the yelling at bay by deciding what you will do whenever the mess gets out of control. At a calm time (so, not while you’re wading through their rooms), inform your kids that they’re old enough to keep their rooms clean. Then say something like, “If your room isn’t clean by dinner every Saturday, I will clean it with a cardboard box. Any toys and clothes not put away will be stored in the basement for a week.” Then, follow through. If you find your kids aren’t missing their favorite toy or coolest jeans, it’s time for a trip to Goodwill. 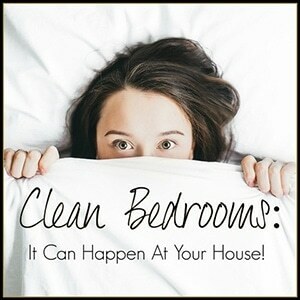 Put these techniques to work, and you and your kids will be well on your way to enjoying clean bedrooms—no song and dance routine required.